The Spring Classics are a unique collection of deeply entrenched, historic one-day races that span Northern Europe – Italy, Belgium, Holland and Northern France to be precise. From the cobbles of Paris-Roubaix to the punchy bergs of the Tour of Flanders, they are a part of cycling’s tradition and provide some of the most exciting and memorable moments in the sport’s history. These iconic races are a world away from the challenges the riders face in the Tour de France and other Grand Tour races. Usually defined by bad weather, they use minor roads and cobbled sections, which often resemble farm tracks. The classics are known as races for the hard men of the peloton, testing physical, mental and mechanical resilience. The five oldest, longest and most prestigious one-day races in professional cycling are grouped together under the heading ‘Monuments’. Milan-San Remo, the Tour of Flanders, Paris-Roubaix, Liège-Bastogne-Liège and Il Lombardia all boast a rich heritage and are the races that every rider wants to have in their list of victories. Only the Grand Tours – the Giro d’Italia, Tour de France and Vuelta a España – command as much kudos. Each of the five races has its own special character that marks it out among the long list of professional races that take place every year. 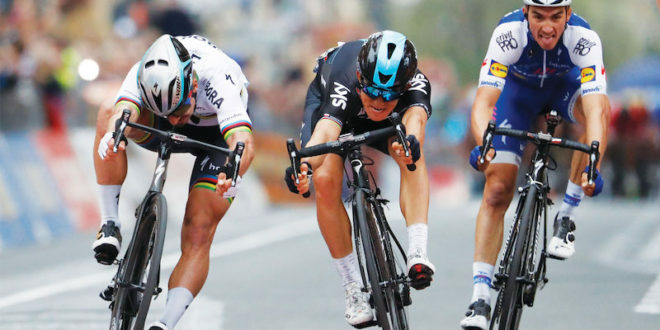 Such are their significance, that riders will tend to target them specifically, make one or more their main aim for the season – riders like Peter Sagan, Greg Van Avermaet, Philippe Gilbert, Sep Vanmarcke and Michal Kwiatkowski. All five are part of the UCI’s top-tier WorldTour race calendar, and as such they command a full field of the biggest teams and leading riders. For cycling fans, they are the most hotly-anticipated races of the year: always entertaining and action-packed. The total distance of Milan-San Remo often stretching out over 300km as the neutralised zone takes the peloton out of Milan’s inner city. The distance so early in the season hasn’t been an issue for the riders, in recent years however, the snow, sleet and rain as the weather conditions have ensured La Classicissima remains one of the hardest one-day races on the calendar. The second monument of the season, the Tour of Flanders holds a special place in the hearts of the Flemish, but it isn’t solely reserved for the Belgians. First held in 1913… Sunday, 7 April 2017, brings the 103rd edition of the Tour of Flanders. The gruelling race is teeming with short, sharp and steep climbs. The riders will leave from Antwerp. The last 75 kilometres are a replica of recent editions, so the finale is marked by the cobbled climbs up Oude Kwaremont and Paterberg. The gruelling route takes in some of Flanders’ most iconic short cobbled climbs, which, packed into the latter half of the race, ensure that only the strongest – and those who make and respond to the right moves – emerge at the finish with a shot at victory. Paris-Roubaix, ‘queen of the classics’, dates back to 1896 and sends riders over cobbled roads that only open for one day of the year, and finishing in the Roubaix velodrome. Paris-Roubaix is loved and lauded and hated and despised with equal measures by the riders who have taken part in the race. The cobbled sectors of Paris-Roubaix make the race with names such as Trouée d’Arenberg, Mons-en-Pévèle and Carrefour de l’Arbre just three examples. Varying in length and difficulty, the cobbled sectors initially were used out of necessity – there were no other roads the race could use. With the advent of live television coverage of the race, there were fears that the cobbled roads would reflect badly on Northern France with suggestions the local councils couldn’t afford new roads. Thankfully the cobbles remain, there is even ‘a friends of the cobbles society – Les Amis de Paris Roubaix – who now look after the sectors and ensure they remain intrinsic features of Paris-Roubaix. The rough terrain it covers in the north of France, near the Belgium border, has earned the Paris-Roubaix the nicknames “l’Enfer du Nord,” “the Hell of the North,” and “A Sunday in Hell.” It is the third of The Five Monuments of Cycling. Where the Tour of Flanders is often a test of the strongest rider in the race, Paris-Roubaix can be a lottery by comparison with mechanicals ending the hopes of hundreds of the cyclists over the years. The unpredictability is also a further drawcard for spectators who line the roadside for the final cobbled classic of the spring. Since 1977, the winner of Paris–Roubaix has received a “sett,” or a cobble stone. The terrain of the race has led to the development of specialised frames, wheels and tires. Punctures and other mechanical problems are common and have often been a deciding factor in the race. The only Monument to take place in the autumn rather than spring, the Tour of Lombardy is very different than its northern European cousins. The picturesque route takes riders around Lake Como in a testing war of attrition. Like Liège-Bastogne-Liège, Il Lombardia has a reputation for being a climber’s classic, taking in longer ascents than the power climbs of the Tour of Flanders. It’s often the final outing for Grand Tour riders seeking to take one final victory before the season ends. One other race to keep an eye on in March is the 77th edition of Paris-Nice, which starts with an out-and-back stage in Saint-Germain-en-Laye on Sunday 10 March. The race concludes on Sunday 17th. The famous Col d’Eze is featured in the finale of the last stage, which obviously runs to Nice. The penultimate stage concludes with a 15 kilometres ascent at 7.3% to the top of the Turini Pass.